India bowled with clinical precision to bundle out the Kiwis for a paltry 157. Former India captain Mahendra Singh Dhoni on Wednesday showed, once again, his class during the first ODI against New Zealand at Napier. During the Kiwi innings, Dhoni guided the spinners with his predictions, how batsmen will play. Towards the end of the innings, Dhoni was heard telling Kuldeep about Trent Boult, "aankh bandh karke rokega, around the wicket daal". That moment when you hear Dhoni tell Kuldeep to go round the wicket and when Kuldeep does, you know exactly what will happen! Dhoni the mind reader, and this is also one reason we need him at the ICC World Cup, 2019 in England and Wales. #Dhoni showed why he is considered most intelligent cricketer. 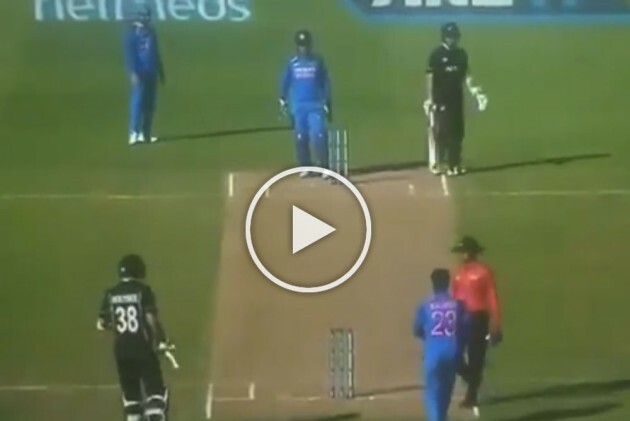 Watch the last of #Newzealand innings, his advice to #kuldeepyadav. "Ye aankh band kar ke rokega, isko idhar se daal sakta hai.."
Dhoni again, Isko idhar se daal. Kuldeep bowls a little away. India bowled with clinical precision to bundle out the Kiwis for a paltry 157. Wrist spinner Kuldeep was the most successful, returning figures of 4/39 in 10 overs, while seamer Mohammed Shami finished with an excellent 3/19 in six overs. There were also two wickets for leg-spinner Yuzvendra Chahal.